Steve Evans stands alongside his U. S. Postage Stamp collection. The display features United States commemorative and regular issue stamps on loan from the private collection of Steve Evans. Mr. Evans has been collecting stamps for about 40 years. He attributes his love of philately (stamp collecting) to his parents and to a special friend, the late Franklin R. Bruns, Jr. His father was a stamp collector who would save some of his stamps for his son. Mr. Bruns was a curator, columnist, and stamp collector for the Smithsonian Institute in Washington, D.C. Included in the display is a special first-day issue stamp of the moon landing, along with Apollo, Gemini, and Space Shuttle stamps. “I kind of favor the space stamps,” Mr. Evans says. Among others, the exhibit also includes stamps reflecting Cowboys of the Silver Screen, Bugs Bunny, Disney characters, Gulf Coast Lighthouses, and Muscle Cars. Of special interest is a one-thousand-piece puzzle that Mr. Evans finished in two days. It features various stamps, such as a one-cent Yosemite stamp, a two-cent Ben Franklin stamp, a three-cent Century of the Telegraph stamp, a four-cent Soil Conservation stamp, and a five-cent American Music stamp. Other stamps in the puzzle reflect various historic events and famous people along with the changing postal rates up to the twenty-cent stamp. The display showcases only a sampling of Mr. Evan’s extensive collection. Mr. Evans served his country in the Navy for 20 years, four of those years as active duty, and the remainder in the Naval Reserves. He is a retired special education teacher with the Alleghany County School System. 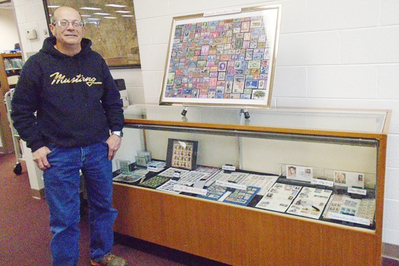 “It’s All About U.S. Stamps” will be on display at the Clifton Forge Public Library throughout April. The Library is located at 535 Church Street. For information on any library programs or activities, phone 863-2519.